I'm liking this dialogue that's happening about leg and hand and being on the bit. I wish it was more of an actual dialogue, this blog template doesn't allow me to reply to you guys, which makes things awkward. I can only post a new comment, and would love to be able to reply without giving up this template. Any Blogger template experts out there? Figured it out, I now have threaded comments! Comment away! 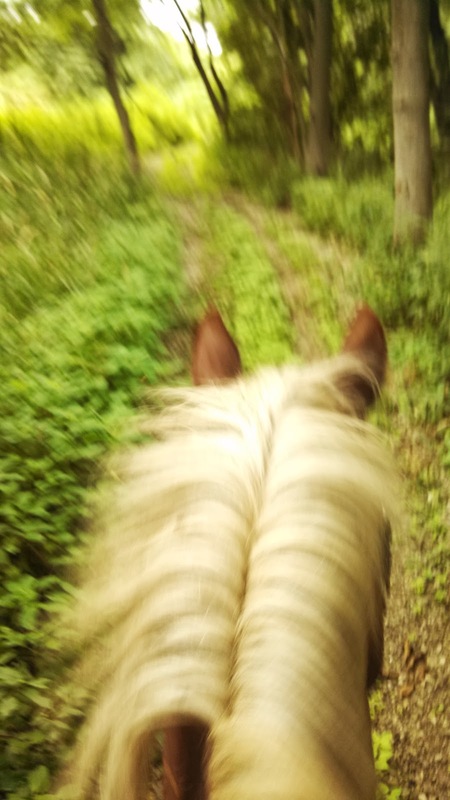 I started out in the grass Dressage arena with Connor yesterday, doing more of the same from my lesson, but he was getting frustrated - flies, me, too much sandbox time, whatever - so I took him on a hack, still asking for the same things I was in the arena. Seconds before we got attacked by a swarm of murderous biting insects. They followed us for 1/4 mile! I ended with large canter circles in the open stadium field, and had a chance to play and think. If I let go of the inside rein while cantering on the left lead, he goes right. If I give him half a chance to go right (i.e. stop asking with every step for left bend), he gets stiff and unbendable. To the right, if I let go of the inside rein, he stays bent and going right. It's much easier to get the right bend in any gait. 1. My weak left leg (riding accident in 2007) isn't strong enough to ask for the bend in the same way I can with the right leg. My strong right leg might be encouraging right bend, too, even going left. 2. I compensate for his lack of bend by holding the inside rein to force a left bend, but never get bend through his whole body, just his neck. 3. Connor's muscles responsible for maintaining the left bend are weak, making it harder for him, so he leans even more on my left rein, causing me to take even more left rein...vicious cycle. I've never thought about my legs so much before until my trainer rode Connor and told me how much leg it required to keep him together. What, leg isn't just to get him moving? Paradigm shift. Spurs are helping, especially on the left side, where I can get a reaction with less leg power. It's all rider-induced, and can be fixed, but I think I am going to have to strengthen the left side first. I'm planning on lots of left lead canter, and of course talking to my trainer on Thursday. We've worked through this before, with doing the square exercise counterbent and doing turns on the haunches at the corners when going to the right, and being bent to the inside and doing turns on the forehand when going to the left. I would try to incorporate some ground work to help build strength on his weak side. Lunging with two lines is a great way to work bend and self carriage. He knows how to do that kind of work from his driving background. I have used this to help both Roscoe and Rosemary with their canter work. Otherwise mounted it sounds like you are on the right track. That's a really good thought. I rarely break out the surcingle, but should. I think you are on the right lines. I have a weak side after a bad riding accident and found that the more leg raises I did and stomach crunches really helped me when riding, don't know if you do this but thought it was worth a comment. Hope you don't mind! Yes, fitness is really important. I do CrossFit five days a week in addition to riding, it really helps! I agree about the ground work, sometimes it can be a huge help! I am right-side dominant, so my right leg and hip are tighter than my left. I have to purposefully swing my right leg forward to the girth for right bend or right canter. If I do not do this, I can block my horse and he cannot bend correctly. Likewise, my left side is weaker and although not generally blocking with tight muscles, I wnat to collapse left. The collapsing can also prevent correct bend and leads and definitely hinders balance in my horse. Analyze your own position. Seemingly small corrections can make a big and often instantaneous difference in your horse's way of going! I thought a lot about this comment yesterday during my ride and it helped lead me to my realization about what my legs have actually been doing all this time. Thank you so much! You are so insightful, both in your blog and in comments.